Jaguar has been a distinct car maker for years. It had its styling ideas, and it was refusing to obey the trends. It was loved by many because of that, but it was criticized by even more. In 2001 company decided to do something, let’s say unordinary, and it entered the compact executive segment with X-Type. The move proved as disastrous. 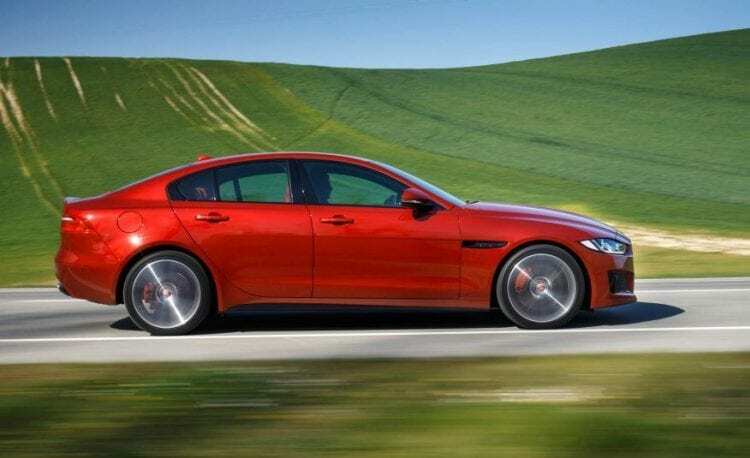 Brand’s fans hated the fact that Jag lowered itself to almost entry level vehicles, hated the first estate in brand’s history and first of all lot’s of people were infuriated by the fact that the car was using Ford Mondeo platform. Furthermore, rest of the potential buyers were also not attracted to pay quite hefty sum for Jag having Mondeo underneath, and some desired less traditional design cues. In short, it didn’t satisfy either side. Jaguar was bought by Tata Motors in 2008, and whole company went through extensive revision. It entered some modern times, and that led to a resurrection of X-Type now known as XE in 2015. Today we have 2018 Jaguar XE which, just after two years on the market, has some novelties to offer. The brand is introducing a whole new range of Ingenium engines consisting of 2.0-liter petrol I4 in two different power outputs of 197 hp and 247 hp as 20t and 25t, new 2.0-liter diesel I4 with 237 hp as 25d, and new E Performance diesel delivering 161 hp and featuring very low CO2 emissions. These are going to be distributed between F-pace, XF and our XE. XE got stronger 2.0-liter petrol L4 which uses the help of twin scroll turbocharger to develop 247 hp and 269 pound-feet of torque. It normally comes in RWD configuration, while AWD is an option and automatic transmission is part of standard equipment. As for the engines, things doesn’t stop there. This model will also receive power boost, and S version will feature 380 hp from 3.0-liter V6 which is raise by 40 hp made possible with the use of a supercharger. New I4 engine equipped vehicle is priced at $35,725, while S model asks for $52,275. One more novelty for 2018 Jaguar XE model year would be the new top of the range limited edition trim. It’s called Portfolio, the name used many times before by brand, and it comes standard with heated rear seats, hands-free trunk opening, power rear sunshades, a 10-inch infotainment touchscreen, a digital instrument cluster, and 825-watt surround sound system with 17 speakers, among other stuff. Jaguar has entered into cooperation with Shell to develop an interesting app. It is currently available only in the UK, but soon it will be available on Shell stations around the world. Once installed on your phone it lets you pay the gas that you just pour into your Jag over the phone using PayPal or ApplePay. That means you don’t have to leave your car in order to pay. Do we need that? No. But car makers have to invent something constantly and sometimes you simply just ran out of ideas. Stuff that stays the same is dynamic and sharp front fascia with angry headlights, also the dull and unimaginative tail, high-quality interior, and maybe best driving dynamics in the class. We would say that in driving joy BMW 3 Series time of reign is coming to an end while some new kids are on the block and apart from Cadillac ATS our XE is one of those. Finally, after X-Type failure this entry level luxury, Jag is something that should be well considered when sporty saloons are in question.